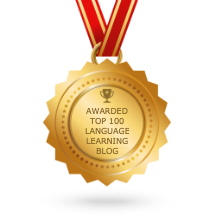 Here at COERLL we have always worked on projects with small teams of professors or teachers to create openly licensed language teaching materials (textbooks, activities, lessons, etc.) that we share with teachers. However, some of our new projects follow a different model: instead of giving teachers materials, we are asking teachers to share with us and with other teachers the in-class lessons or activities they have created, and to support each other in further developing and testing these materials. To inspire people to start sharing, we created this infographic that shows all of the ways sharing can impact teachers, students, and the community, but I wanted to get a firsthand account of this impact from a teacher, so I asked Amy Lenord, a Spanish teacher, consultant, blogger, #langchat moderator, and 2015 Texas Foreign Language Association president. She helped me envision how that one simple act of sharing can be a catalyst for a whole set of other practices. Amy and many other bloggers have inspired me as they share their great ideas and successes right along with the ideas that didn’t quite work the way they wanted them to. This openness creates a forum for feedback and ideas from other teachers dealing with the same challenges. Whether online or face-to-face, feedback from other teachers is part of a larger iterative process that “only works if you are willing and transparent”, as Amy says. A teacher who considers reactions from other teachers and integrates that into their work will probably also pay attention to reactions of students, going back to a lesson after it’s done to evaluate how it worked and figure out how to do it differently the next time. Amy talks about developing a lesson like it is a scientific process, albeit a creative one: hypothesizing about what will work, testing it out with students, observing results, consulting other teachers, making changes, and going back into the classroom with the students to teach and observe, starting the process all over again. As she puts it, “teaching is organic. I can’t teach the same way in two consecutive years”. Amy Lenord claimed to not be a part of the open educational movement when we talked, but she exemplifies it in every way, by her willingness to tell others a story about what she is doing, to change her methods to fit her students’ needs, and to accept and give feedback as part of a community of teachers. Of course, as a center for open educational resources, we will always provide resources that are licensed to be modified, copied, and shared. But, these resources are nothing without the process that a teacher will go through to make them effective, and the act of sharing can make this process even more rich. COERLL’s Heritage Spanish page is a place to share resources created or simply found by teachers who have experience with speakers of Spanish as a heritage language. COERLL’s Foreign Languages and the Literary in the Everyday project gathers teachers to create and share classroom activities around the central theme of finding playful, non-conventional language in everyday texts like memes and graffiti. Terri Nelson (California State University) has been creating Paris occupé, a role-playing-game to teach French language, history, and critical thinking. You can learn more in this webinar video. If you might be interested in testing the game, let us know at info@coerll.utexas.edu!